Wisk together the flour, Hi-maize fiber (or additional flour), MacYourself™ cheese powder, dry mustard and salt. Using your fingers, a fork, a pastry blender, or mixer, work in 6 tablespoons cold unsalted butter (cut in 1/2″ cubes). The mixture will be crumbly, but unevenly crumbly; some pieces of butter should remain in bigger chunks. Toss in 1/4 cup shreddedd parmesan cheese. Then drizzle in 2 to 3 tablespoons cold water, tossing the mixture around and stirring until it becomes cohesive. Note: If you use flour instead of Hi-maize, you’ll probably need up to 4 tablespoons water. Once you can squeeze the dough and it holds together, shape it into a rough disk. Wrap in plastic, and refrigerate for 30 minutes, while you make the filling. Heat 2 tablespoons unsalted butter over medium heat in a large pan until foaming. Add 1 cup chopped onion (about 1 medium onion), and cook for 5 minutes. Add 8 ounces white mushrooms, sliced; cook until the mushrooms start to lose their juices, about 10 minutes. Mix in 3 large cloves garlic, peeled and finely chopped; 1 teaspoon dried thyme (or 1 tablespoon fresh); 1/2 teaspoon salt, and 1/4 teaspoon ground black pepper. Stir to combine; remove from the heat. Preheat the oven to 375F. Transfer the dough to a floured surface. If it’s been refrigerated longer than 30 minutes, give it 5 to 10 minutes to soften up a bit. Roll the crust into a 1/4″ thick disk, about 12″ to 12 1/2″ in diameter. Next, gently settle the crust into a 9″ pie pan. Squeeze the edges of the crust between your fingers so they’re not raggedy, then crimp. You want to make a tall crimp, rather than simply flattening the edges of the crust with a fork; a taller crust helps contain a liquid filling, which quiches always have. Line the bottom of the crust with 1 cup shredded sharp cheddar cheese. Spoon the mushroom mixture on top. Whisk together 8 large eggs, 1/2 cup milk, and 1/2 teaspoon salt. Pour this mixture into the crust. Set the pie pan on a parchment-lined baking sheet. If there are any leaks, the parchment/pan will save you some cleanup. Plus, the baking sheet makes it easier to transport the quiche into the oven without spills. 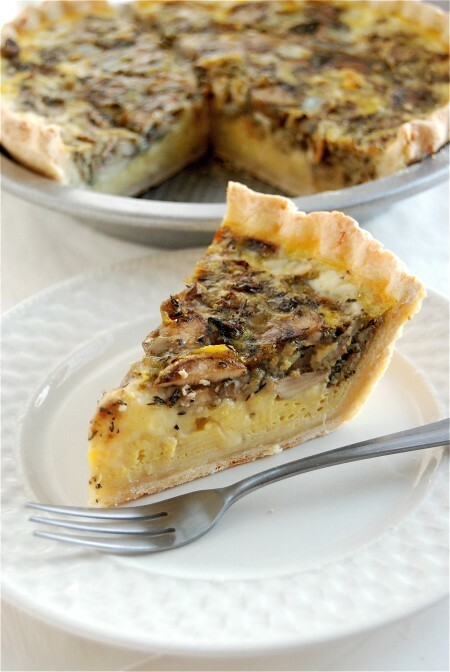 Bake the quiche for 35 to 40 minutes, until the edge of the crust is brown, and the filling appears set. It may not look completely set in the center but if the center reads at least 160°F on an thermometer, you’re all set. Let the quiche cool for 10 minutes or so, then slice.